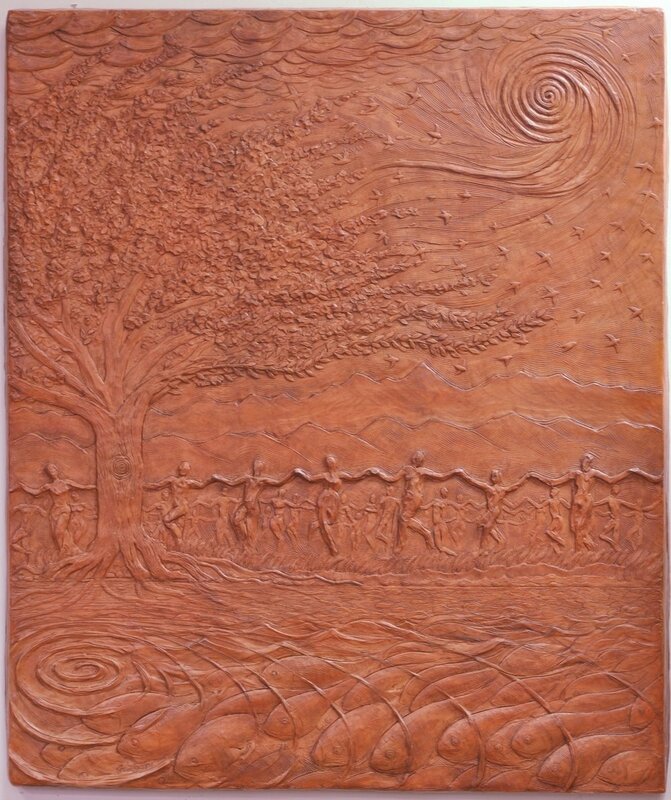 In this large, cast-stone, bas-relief plaque I portray the all encompassing, interconnected energy of life. I have taken two basic shapes, a leaf and a spiral, and used them to visually unite different aspects of life. The fish in the water are leaf-shaped. They stir up turbulence that ripples back to the roots of the tree and courses up to the branches, where the leaf shape reappears in the leaves, which transform into birds, whose leaf-shaped bodies spiral up to the heavens, where clouds echo the shapes of the school of the fish below. The birds fly up to the energy spiral of the sun, winds, or God in the heavens. The spiral, echoed on the surface of the water below, links heavenly energy to water energy, and in a knot in the tree trunk, links earth and plant energy.